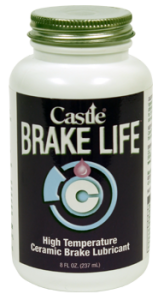 Castle® Brake Life C™ ceramic synthetic brake lubricant provides extreme performance lubrication for today’s demanding brake systems. Its long lasting, non-melt formula combines the high-temperature benefits of proprietary ceramic solids with unique lubricants to prevent brake squeal, noise, and chatter. Critical brake components remain lubricated and resist corrosion without washing out. It is compatible with all rubber components and plastic hardware. Performance range from -65° F to 1649° F.
As a lubricant for today’s automotive braking systems. 1. 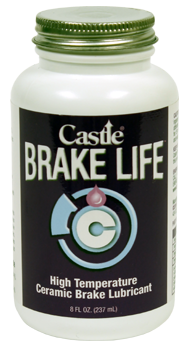 Clean brake parts With Castle® Brake Bath™ .